James Treadwell was diagnosed with a Glioblastoma Multiforme Grade IV brain tumor in 2004. He has been cancer-free since 2006. An MRI performed in 2010 has confirmed that he is still cancer-free today. #1 Diagnosis: Pathologists performed a biopsy at the Naval Medical Center in San Diego, CA establishing his diagnosis [PDF]. A second opinion was sought at the UCLA Medical Center which also verified his diagnosis [PDF]. 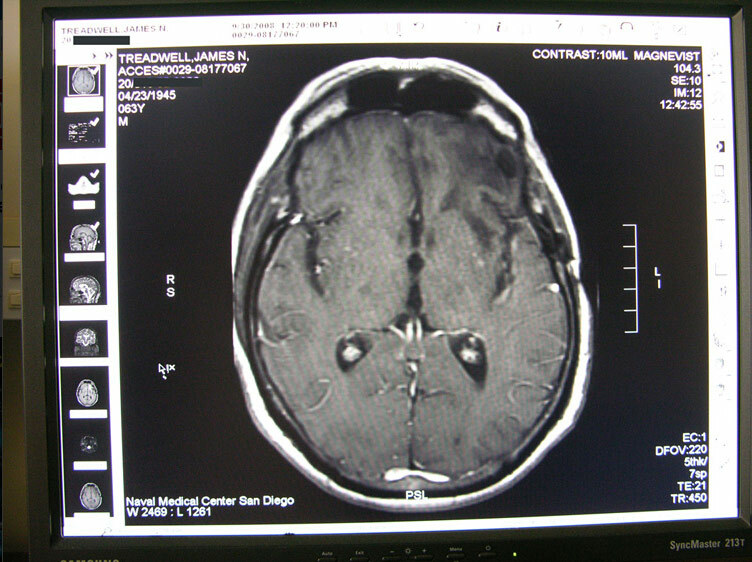 See the Baseline MRI: 9/22/2004 [view image]. #2 Prior Treatment: Prior to Antineoplaston treatment, James Treadwell underwent two surgeries (craniotomies), a Gliadel wafter placement, six weeks of standard radiation treatment (from June 22 to August 4, 2004), three cycles of Temodar® chemotherapy (from June 23 to August 20, 2004). None of these treatments cured Mr. Treadwell of his cancer. In fact, after the second surgery no residual cancer was found, and after the course of radiation and chemotherapy his cancer had returned and doubled in size by September 14, 2004. #3 Recovery: After two surgeries, a Gliadel wafer, and 6 weeks of both chemotherapy and radiation failed to rid Mr. Treadwell of his brain cancer—on September 24, 2004 James Treadwell was admitted for administration of Antineoplaston treatment. He did not receive any other treatment other than Antineoplaston treatment after September 24, 2004. On November 30, 2006 his cancer was gone [PDF of tumor measurements]. [PDF of ANP treatment summary]; [11/30/2006 MRI image]; [11/2008 MRI image]. The New England Journal of Medicine Published a study from 2005 stated: “Glioblastoma, the most common primary brain tumor in adults, is usually rapidly fatal. The current standard of care for newly diagnosed glioblastoma is surgical resection to the extent feasible, followed by adjuvant radiotherapy. In this trial we compared radiotherapy alone with radiotherapy plus temozolomide [Temodar®], given concomitantly with and after radiotherapy, in terms of efficacy and safety.” This is the same treatment Mr. Treadwell received prior to being treated with Antineoplastons. It should be noted that Senator Ted Kennedy died of Glioblastoma Grade IV brain cancer. Countless Glioblastoma survivors cured by Antineoplastons as well as many other people cured of other types of cancer due to Antineoplastons flooded Kennedy’s office to share with him the existence of Antineoplastons. Mr. Kennedy’s wife wrote the Burzynski’s Clinic requesting all communication from Antineoplaston treated cancer survivors stop contacting his office entirely. A year later, Kennedy was dead. Lt. Col. James Treadwell’s medical records are published by written authorization by Lt. Col. James Treadwell. This entry was posted	on Sunday, August 9th, 2015 at 11:01 pm	and is filed under Blog. You can follow any responses to this entry through the RSS 2.0 feed. You can leave a response, or trackback from your own site.